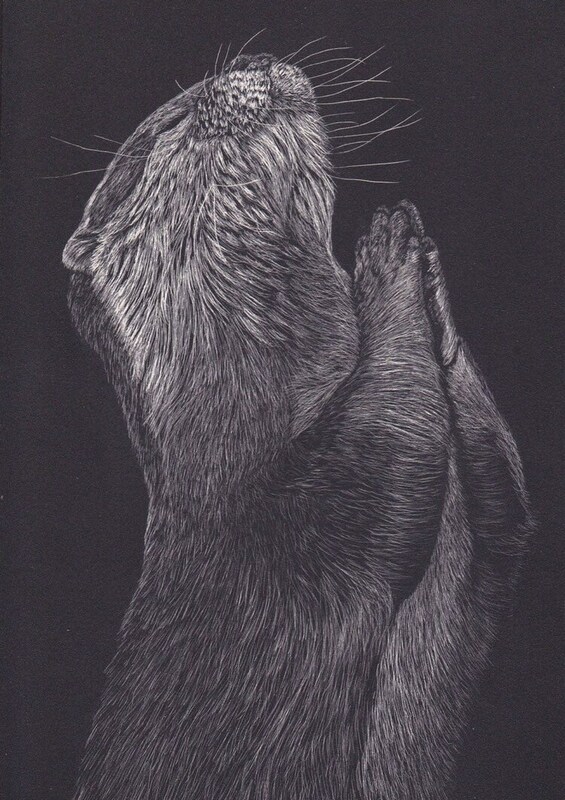 Namaste Otter one of a kind scratchboard! It's amazing that otters actually will hold their hands in a prayer position during grooming. Take a look while at the zoo or if you're lucky enough, in the wild! This 5x7 inch etched scratchboard has been rendered line by line to create the image shown. The scratchboard is a Masonite hardboard covered in white clay and then topped off with india ink. Removing the black ink with sharp implements reveals the white below and creates the image shown. This process takes hours and is an exercise in precision. I hope you like Namaste Otter as much as I do!